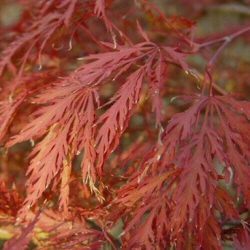 Buy Japanese Maple Tree (Acer palmatum `Garnet`) online from UK supplier of ornamental garden trees. Garnet is a really eye-catching, because of its almost glowing red foliage. On opening the leaves are a bright red colour, slowly deepening until they change to the beautiful garnet colour, hence its name. Along with other Japanese maples, this small tree could form part of a Japanese themed garden. Alternatively, keep this tree in a large container and is ideal for a very small patio or terraced garden as it only grows to 1.8m (6ft). This tree is supplied at a height of 0.3m-0.6m in a 7.5 Litre container, which means that the tree can be planted any time of the year and with better results than either bare-root or rootballed trees.